Customers who pay using NFC mobile payments are more likely to leave a tip, according to a survey by mobile POS provider Square. 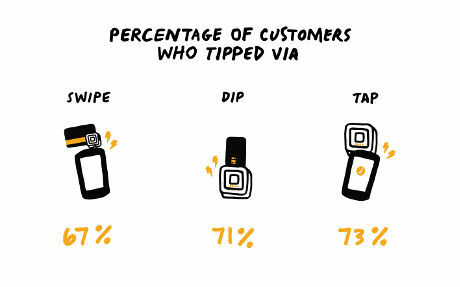 73% of customers tipped when using NFC mobile payments compared to 71% who tipped using EMV and 67% who paid using magnetic stripe cards at the point of sale. The results come after Square spent six months in Portland for its #PayFasterPortland campaign which saw the company educating local businesses about NFC mobile payments. As a result, “thousands” of Portland sellers implemented Square’s new contactless and chip reader, the company says. “Over the two-month #PayFasterPortland campaign, more and more Portlanders started using their mobile devices to pay at businesses that have upgraded to Square’s new contactless and chip reader,” Square writes in a blog post. Square CEO Jack Dorsey revealed in March 2016 that Square has received more than 350,000 pre-orders for the reader. The company began rolling out its first contactless readers in November 2015. The readers can now also be paid for in weekly instalments.